Harrison Ford is an American actor and film producer who is best known as Han Solo and Indiana Jones. In 1997, Ford was ranked No. 1 in Empire‍‍ '​‍s "The Top 100 Movie Stars of All Time" list and he is the 4th highest grossing U.S. domestic box-office star, with US domestic box office grosses of his films totaling over US $3.5 billion. His career has spanned six decades and includes roles in several Hollywood blockbusters. Outside of Star Wars and Indiana Jones, Ford has also starred as Rick Deckard in the 1982 neo-noir dystopian science fiction film Blade Runner, Jack Ryan in the 1992 action-suspense film Patriot Games and the 1994 spy action thriller film Clear and Present Danger, Colonel G. Lucas in the 1979 American epic adventure war film Apocalypse Now, Dr. Richard Kimble in the 1993 film The Fugitive, President James Marshall in Air Force One, and Bob Falfa in the coming of age comedy-drama film American Graffiti. Ford has been known to be one of Hollywood's most private actors, guarding his personal life. He lives here on an 800-acre (3.2 km) ranch in Jackson, WY, part-time with his wife Calista Flockhart with approximately half of which he has donated as a nature reserve. As he is a private pilot of both fixed-wing aircraft and helicopters, several times, he has personally provided emergency helicopter services at the request of local authorities, in one instance rescuing a hiker overcome by dehydration. 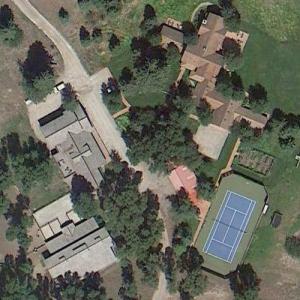 Two other of his Los Angeles-area properties are also featured on this site. Harrison Ford's net worth is $210 million.